Optical clarity and dimensional stability at an economical price! This rigid, flat PVC film is designed for overlays, stencils, and protective coverings. It is acid-free and contains no plasticizers. 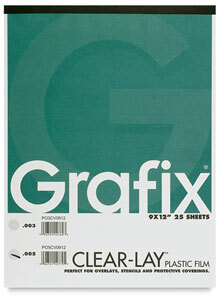 Pads contain 25 clear sheets, .005" thick.